Everything you need to know about Frugal Festival Food! Free food alert! Munch on Libertine’s bacon-wrapped tater tots, chili and dogs from The Stand, CA-grown fruit from Albertsons, and frozen yogurt from Yozen Frogurt. We have more than 100 Raffle and Door prizes worth $3,000 waiting for you! Tickets are $5 with a canned good and include a high-quality Envirosax swag bag that is worth $9 before it’s stuffed with goodies! We’ve got a lot planned for you, including an Early Bird Raffle, a coupon class, and more. You won’t be late with this timeline of events. Test your coupon know-how in our Coupon Challenge to win a $300 gourmet gift basket from Albertsons and Shortcuts! If you missed the online recipe contest, you’ll have a chance to submit an original recipe at the Bargain Babe table at the Festival! The Festival supports the LA Regional Food Bank. If you missed my review, this tiny cookbook is packed with 127-paged of recipes for breads, desserts, main entrees, soups and salads, and sandwiches. 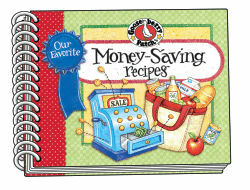 “Money-Saving Recipes” is a compilation of the authors’ favorite frugal recipes. Each recipe comes with an introduction that includes thrifty tips. Most of the recipes are one-pot meals, which reduces clean up. I asked you to share who does the dishes in your home and this is what the winners responded. Lynda Del shared her families rule. Nina K said she does the dishes, but doesn’t really like it. im the dishwasher at my house. im patiently waiting for the day that my kids are tall enough to reach in the sink! If you didn’t win, you can buy it on Amazon for $7.95 or win one of 8 copies that will be given away as door prizes at the Festival in LA on June 25. Thanks to all of you who participated in our lighting book review giveaways.